"Know this, that I am Flavius Paullus Gaudens, sworn of the Temple of Minerva. Know that it is my right as the shepherd of your kind for these three decades to pronounce judgment upon you. Know that it is my right as a father to claim vengeance for the murder of my virgin daughter. "You shall not go unpunished. "You may seek right to appeal, but know also that the most you can expect from me is a swift destruction. You may choose the flames or my blade. But your end is assured." 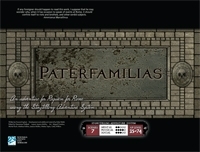 Paterfamilias contains a collection of scenes, Storyteller character records, a number of hyperlinks to various portions of the text as well as bookmarks, so you can always jump right to what you need with just a click. There's also a new hunter group provided, as well as errate for Requiem for Rome and Fall of the Camarilla. This title was added to our catalog on February 25, 2010.